I want to share with you my thoughts on budopractise. How to remain a fresh trainingspirit, stay motivated and approach each practise with an open mind. I started with Aikido in 1996 in the dojo of Paul Janssen sensei. He named his dojo Sho Shin, referring to the Zen Buddhist principle ‘Shoshin’ which translates to “beginnersmind”. Meaning in your practise you try, each training again, to have an open mind and heart. Study techniques as if it were the first time. Sounds good, doesn’t it? But it’s also pretty difficult. After this first period, at some stage in your practise, a new phase arrives: Bit by bit you start to see how much you don’t know. You start to realise there are many layers and levels to your study and the depth seems neverending. You start having thoughts like “Aaaaarrggg I will never learn this” “I’m making the same mistakes over and over…” Sounds familiar? Great! This is a sign that you are actually making some progress. You are expanding your perspective! In a strange way, this phase can also have a negative effect and create the feeling that you’re not progressing. This is the time when many new budopractitioners think about quitting their practise. NO! DON’T STOP NOW! Continue your practise and I’m sure you’ll overcome this phase. I went through it and I know for a fact many -if not all- budopractitioners recognise this. Right after my shodan (black belt) exam in 2007 my teacher told me I was now finally a true beginner. “Sho” in Shodan meaning “the beginning” of your do (path). What? A beginner??? After all those years? Looking back this was exactly what it was. The technical foundation was now there to bring my search to the next level. In these words of my teacher I found extra motivation to continue my path. I started to pick up the pace and felt increasingly hungry for new information. Now I was progressing further. Not just by passing my nidan and sandan (2nd and 3th degree) tests; In 2013 I started my dojo ‘Aishinkai Aikido’ to have a place to find new layers in my study by teaching and to share my enthusiasm for Aikido with beginners. When you have trained for years and your level in your budo grows, there’s always the risk of loosing your ‘Shoshin’, your fresh trainingspirit and beginnersmind. You feel as if you know it all. “been there done that”. My teachers told me never to forget what it felt like to be a beginner. Even the higher ranking budoka are still beginners. They simply never quit practising, but they to still have a long road ahead. The study is never at an end! 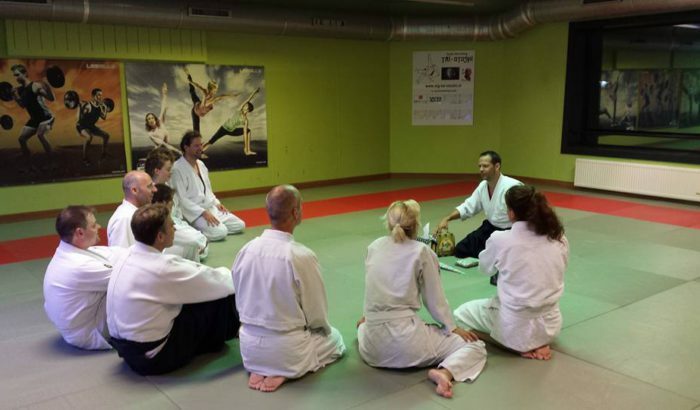 I have always attended many Aikidoseminars and I still train actively with my teachers. Over the years I found inspiration with lots of different teachers and styles. Untill this very day the lessons of my teachers inspire me. And I try to share my inspirations with my students. This to helps me to keep in touch with my beginnersmind! 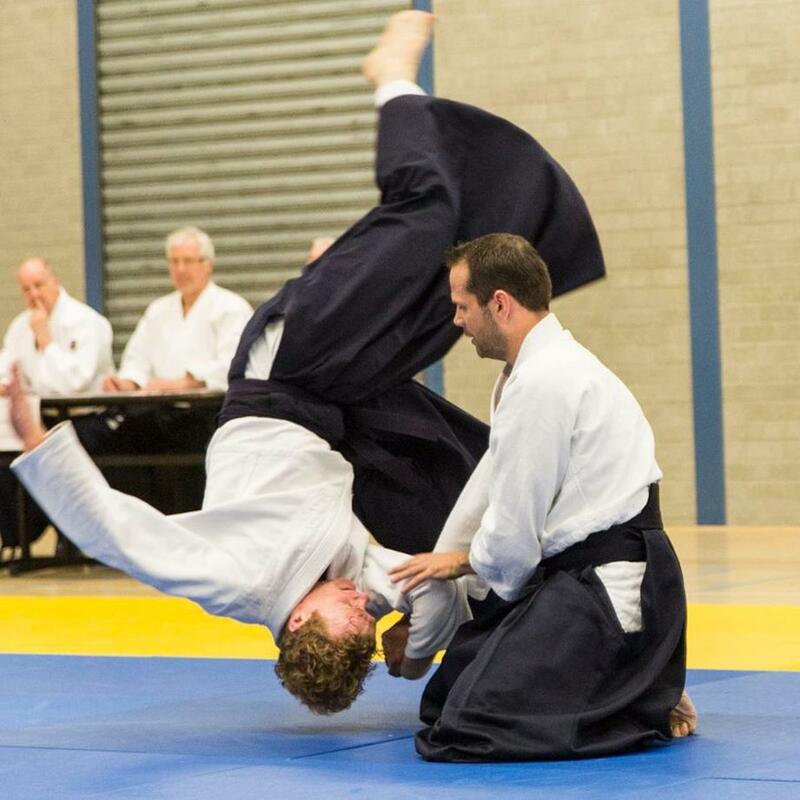 This year I started teaching a weekly Aikido class for handicapped children at sportsclub Only Friends in Amsterdam. A new and exciting experience. These kids are truly very special and they show me every week what it really means to have an open mind and overcome challenges. It’s funny….I teach them but in reality I am the one doing the learning. I realise again that, at some level, we all have our disabillities we need to overcome. The practise of budo, to me, is about dealing with difficulties and challenges our daily life presents us. Also I found some new budo inspiration besides Aikido, with the practise of Brazilian Jiu Jitsu (BJJ). Late nineties I met with Raoul Hiwat. 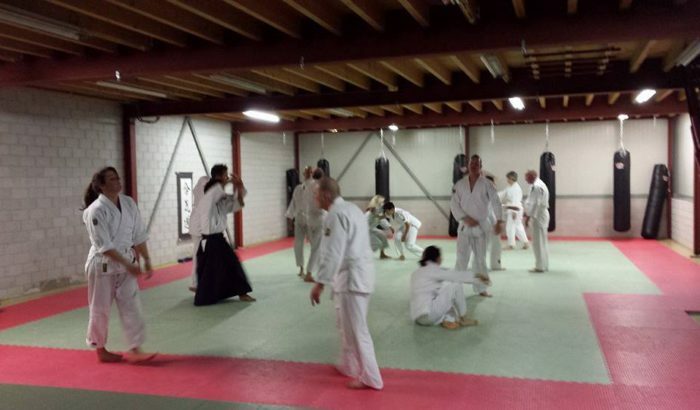 We practised Aikido together at Paul Janssen’s dojo in Amsterdam. 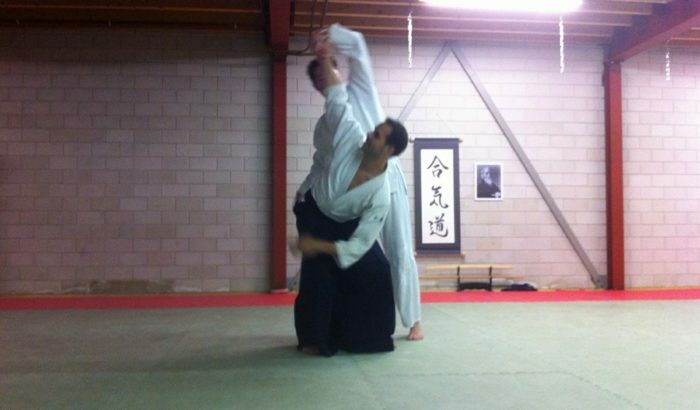 At some point Raoul decided to continue his budo journey in the practise of BJJ and I kept on practising Aikido. Over the years we kept in touch and followed eachothers budoroutes. Raoul is now a BJJ black belt and has his own school, Amsterdam BJJ. Over the years he invited me several times to join a training. I always found many excuses not to go;) Finally, after some hesitation, I took up the invitation and joined a class. It was supposed to be just once…. but it was such a great experience that now I practise BJJ weekly besides my regular Aikidopractice. Somehow I thought my budomind was “experienced” after many years of Aikidopractise. But quickly I found that on the BJJ mats I am a beginner again. The crispy white belt suits me just fine:) BJJ makes me re-think what I thought I knew. New information, new techniques, new dynamics, new budo, new people. Refreshing and it’s ofcourse good to take a look at another budo discipline and stretch the horizon! Only Friends Aikido and BJJ are my newest reminders to stay in touch with my ‘Shoshin’, my beginnersmind. I have felt the insecure feeling and confusion again that comes with a new start. I realise again practising budo is a never ending and beautiful path. Budopractise, to me, is about working hard on the mats to achieve a good quality of life. It’s about feeling alive, connecting with other people, about having a healthy and fit mind and body (ok, sometimes my body hurts…but it’s worth it!) And ofcourse it’s great fun! Once you think you “made it”…quickly set new goals and carry on practising! Very rewarding! So, work hard and enjoy your practise on the mats and bring this positive spirit into your life, your work and all you do. Enjoy life, practise budo! 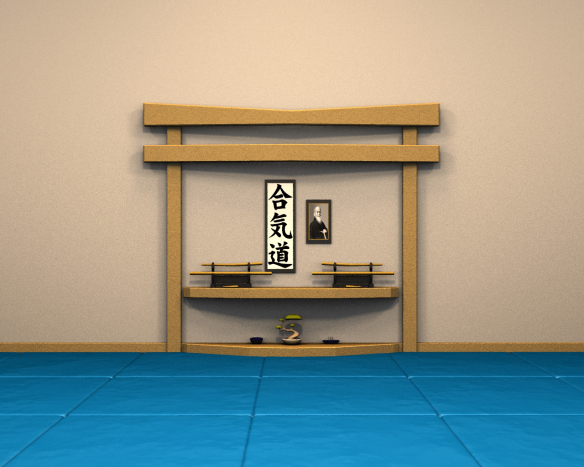 realy inspiring for a ´Shoshin´ Aishinkai aikidoka! Thank you for your post. I’m a 43 year old mum who’s always wanted to learn the sword and become a ninja 🙂 After watching my 5yr old roll around on the mats and earn his first grading in Hapkido, I couldn’t find a reason not to join in. Now, despite having a body that needs more time to recover, I have found a new path that feels perfect for me. But you’re right there is no ‘instant gratification’ at the press of a button, it’s a long path, to be enjoyed and savoured along the way. Thanks for your reply Michelle. That’s also an inspiring choise you made. The best choises are not always the easy ones 🙂 Enjoy your training!